Another all-in-one solution that is easy to install and user friendly. 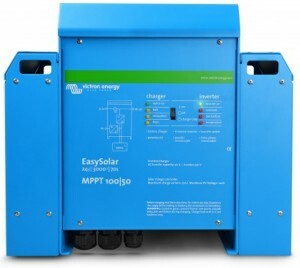 Charge your batteries with solar power the easy way with the Victron EasySolar. Do you need solar equipment? Contact us now for great prices today! PV connection Six sets of MC4 (PV-ST01) PV connectors. Six sets of MC4 (PV-ST01) PV connectors. 6b) PV voltage must exceed Vbat + 5V for the controller to start.